Epidemiological data suggest that there is a log—linear association between cholesterol concentration and cardiovascular risk, with no flattening of the curve at low concentrations of blood cholesterol. Therefore a tempting option is to decrease LDL-cholesterol concentration as much as possible. In practice, doubling the statin dose is fairly inefficient, because it reduces LDL cholesterol by about 6% (rule of six). (see statin benefits). At the same time, the incidence of adverse effects starts to rise at increased doses. More recently developed statins (e.g., atorvastatin and rosuvastatin) can reduce LDL cholesterol by about 60%, but an older statin such as simvastatin cannot achieve this reduction without use of a high dose or without adding ezetimibe. In SEARCH, myopathy was more frequent with 80 mg than 20 mg simvastatin daily. Statin dose-related adverse experiences have been shown to be associated with increased risks of hepatic transaminases and muscle symptoms, including myalgia, myopathy, and rhabdomyolysis. The consistently lower values of coenzyme Q10, especially its reduced form, in Indian males may contribute to the higher susceptibility of this ethnic group to CAD (coronary artery disease).3 Nocturnal cramps may respond to 12 oz of tonic water which contain quinine. A high prevalence of NAFLD (15% in adults and 1% in children) is also reported from China17 (diagnosis was based on anthropometric measurements, alcohol use, biochemical tests, ultrasonography). Among other things both BMI (body mass index) and waist circumference were strong risk factors for this condition. Statin treatment (and possibly niacin when given in combination with statins) appears to be associated with a slightly increased risk of new onset diabetes. In a recent meta-analysis of 13 statin trials comprising of 91,140 participants, 4,278 patients (2226 assigned to statins and 2052 assigned to the control group) developed diabetes during a mean of 4 years. Statin therapy was associated with a 9% increased risk for incident diabetes with no difference between hydrophilic and lipophilic statins. Treatment of 255 patients with statins for 4 years resulted in one extra case of diabetes but would prevent 9 heart attack, stroke or death. (for an 80 mg/dL decrease in LDL-C). Thus, statin therapy is associated with a slightly increased risk of development of diabetes, but the risk is low both in absolute terms and when compared with the reduction in coronary events. 24 This slight increase in diabetes does not warrant any change in clinical practice. The risk/benefit ratio of statin treatment in populations at high risk of diabetes such as Asian Indians has not been studied but the current evidence does not justify the avoidance of statins for the fear of diabetes. Long-term safety and efficacy of statins was recently demonstrated extended follow-up of the Heart Protection Study, which enrolled 20,536 patients at high risk of vascular and non-vascular outcomes.12 Patients were randomized to 40 mg simvastatin (Zocor) daily or to placebo, and were followed for a mean of 5.3 years during the trial and for six years during a post-trial period. 12 During the initial trial, the researchers found that simvastatin yielded an average LDL reduction of 40 mg/dl, which was linked with a 23% decrease in major vascular events and an 18% reduction in vascular mortality. There were no differences in non-vascular mortality during either period ─ particularly, there were no differences in cancer death or cancer incidence at all sites or any particular site. The results provide contemporary and confirmatory evidence that extended use of statins is safe with respect to possible risk of cancer and non-vascular mortality. It appears that the original concerns about statin safety were from observational data, which were likely heavily confounded. The balance of evidence now tips in favor of statins’ safety and efficacy, and long-lasting benefits, even after stopping therapy. Time has come to put an end to the concerns on statin safety and doctors should feel reassured about the long-term safety of this life-saving treatment for patients at increased cardiovascular risk. 1. Enas E.A., Hancy Chennikkara Pazhoor MD, Arun Kuruvila MBBS, Krishnaswami Vijayaraghavan MD F. Intensive Statin Therapy for Indians:Part II Risks. Indian Heart J (In press). 2011. 2. Enas E.A., Hancy Chennikkara Pazhoor MD, Arun Kuruvila MBBS, Krishnaswami Vijayaraghavan MD F. Intensive Statin Therapy for Indians:Part I Benefits. Indian Heart J 2011; 63: 211-227. 3. Hughes K, Lee BL, Feng X, Lee J, Ong CN. 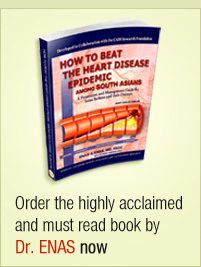 Coenzyme Q10 and differences in coronary heart disease risk in Asian Indians and Chinese. Free Radic Biol Med. 2002;32(2):132-138. 4. Athyros VG, Tziomalos K, Gossios TD, et al. Safety and efficacy of long-term statin treatment for cardiovascular events in patients with coronary heart disease and abnormal liver tests in the Greek Atorvastatin and Coronary Heart Disease Evaluation (GREACE) Study: a post-hoc analysis. Lancet. Dec 4 2010;376(9756):1916-1922. 5. Law M, Rudnicka AR. Statin safety: a systematic review. Am J Cardiol. Apr 17 2006;97(8A):52C-60C. 6. Cohen DE, Anania FA, Chalasani N. An assessment of statin safety by hepatologists. Am J Cardiol. Apr 17 2006;97(8A):77C-81C. 7. Pasternak RC, Smith SC, Jr., Bairey-Merz CN, Grundy SM, Cleeman JI, Lenfant C. ACC/AHA/NHLBI clinical advisory on the use and safety of statins. J Am Coll Cardiol. Aug 7 2002;40(3):567-572. 8. Tolman KG. The liver and lovastatin. Am J Cardiol. 2002;89(12):1374-1380. 9. Russo MW, Galanko JA, Shrestha R, Fried MW, Watkins P. Liver transplantation for acute liver failure from drug induced liver injury in the United States. Liver Transpl. Aug 2004;10(8):1018-1023. 10. Enas E.A., Hancy Chennikkara Pazhoor MD, Arun Kuruvila MBBS, Krishnaswami Vijayaraghavan MD F. Intensive Statin Therapy for Indians:Part I Benefits.Indian Heart J (In press) Indian Heart J (In press). 2011. 11. Athyros VG, Tziomalos K, Daskalopoulos GN, Karagiannis A, Mikhailidis DP. Statin-based treatment for cardiovascular risk and non-alcoholic fatty liver disease. Killing two birds with one stone? Ann Med. May 2011;43(3):167-171. 12. Yoo J, Lee S, Kim K, Yoo S, Sung E, Yim J. Relationship between insulin resistance and serum alanine aminotransferase as a surrogate of NAFLD (nonalcoholic fatty liver disease) in obese Korean children. Diabetes Res Clin Pract. Sep 2008;81(3):321-326. 13. Kunde SS, Lazenby AJ, Clements RH, Abrams GA. Spectrum of NAFLD and diagnostic implications of the proposed new normal range for serum ALT in obese women. Hepatology. Sep 2005;42(3):650-656. 14. Vuppalanchi R, Teal E, Chalasani N. Patients with elevated baseline liver enzymes do not have higher frequency of hepatotoxicity from lovastatin than those with normal baseline liver enzymes. Am J Med Sci. Feb 2005;329(2):62-65. 15. Chalasani N, Aljadhey H, Kesterson J, Murray MD, Hall SD. Patients with elevated liver enzymes are not at higher risk for statin hepatotoxicity. Gastroenterology. May 2004;126(5):1287-1292. 16. Misra A, Misra R, Wijesuriya M, Banerjee D. The metabolic syndrome in South Asians: continuing escalation & possible solutions. Indian J Med Res. Mar 2007;125(3):345-354. 17. Zhou YJ, Li YY, Nie YQ, et al. Prevalence of fatty liver disease and its risk factors in the population of South China. World J Gastroenterol. Dec 21 2007;13(47):6419-6424. 18. Russo MW, Jacobson IM. How to use statins in patients with chronic liver disease. Cleve Clin J Med. Jan 2004;71(1):58-62. 19. Chalasani N. Statins and hepatotoxicity: focus on patients with fatty liver. Hepatology. Apr 2005;41(4):690-695. 20. Amarenco P, Goldstein LB, Szarek M, et al. Effects of intense low-density lipoprotein cholesterol reduction in patients with stroke or transient ischemic attack: the Stroke Prevention by Aggressive Reduction in Cholesterol Levels (SPARCL) trial. Stroke. Dec 2007;38(12):3198-3204. 21. Hackam DG, Austin PC, Huang A, et al. Statins and Intracerebral Hemorrhage: A Retrospective Cohort Study. Arch Neurol. Sep 12 2011. 22. Athyros VG, Tziomalos K, Karagiannis A, Wierzbicki AS, Mikhailidis DP. Aggressive statin treatment, very low serum cholesterol levels and haemorrhagic stroke: is there an association? Curr Opin Cardiol. Jul 2010;25(4):406-410. 23. Noda H, Iso H, Irie F, et al. Low-density lipoprotein cholesterol concentrations and death due to intraparenchymal hemorrhage: the Ibaraki Prefectural Health Study. Circulation. Apr 28 2009;119(16):2136-2145. 24. Sattar N, Preiss D, Murray HM, et al. Statins and risk of incident diabetes: a collaborative meta-analysis of randomised statin trials. Lancet. Feb 27 2010;375(9716):735-742. 25. Preiss D, Seshasai SR, Welsh P, et al. Risk of incident diabetes with intensive-dose compared with moderate-dose statin therapy: a meta-analysis. JAMA. Jun 22 2011;305(24):2556-2564. 26. Athyros VG, Tziomalos K, Karagiannis A, Mikhailidis DP. Lipid-lowering agents and new onset diabetes mellitus. Expert Opin Pharmacother. Aug 2010;11(12):1965-1970. 27. Baigent C, Keech A, Kearney PM, et al. Efficacy and safety of cholesterol-lowering treatment: prospective meta-analysis of data from 90,056 participants in 14 randomised trials of statins. Lancet. Oct 8 2005;366(9493):1267-1278. 28. Ford I, Murray H, Packard CJ, Shepherd J, Macfarlane PW, Cobbe SM. Long-term follow-up of the West of Scotland Coronary Prevention Study. N Engl J Med. Oct 11 2007;357(15):1477-1486. 29. Sever PS, Chang CL, Gupta AK, Whitehouse A, Poulter NR. The Anglo-Scandinavian Cardiac Outcomes Trial: 11-year mortality follow-up of the lipid-lowering arm in the UK. Eur Heart J. Oct 2011;32(20):2525-2532.